*The Coach is any person on the team that is designated prior to a given match to be that person’s coach for the entire match. (does not have to be the captain). Please try to use the NEW app (TAP the App) to keep score. Only one person on either team needs to run the app, but should keep phone in full view of both teams. Max players per team is 8. Player’s handicaps range from 2 to 7 and 5 players from both teams square off and race according to handicap chart. Max handicap of 5 players playing is 25 points. 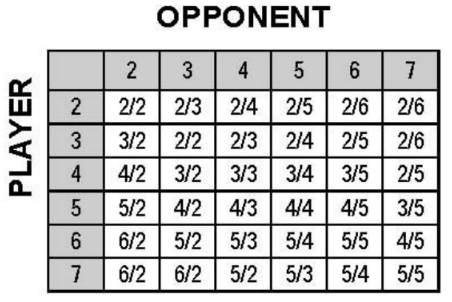 8 on the break is a win unless scratch which is a loss. After a scratch on the break, the opponent shoots from the kitchen. Open after the break regardless of what is made. Must call pocket to have a completed shot and continue shooting (We don’t play slop in this joint! ).